Get Set for the 10th Annual Daytona Beach Half Marathon! Get in gear for a fun event that is sure to garnish many new memories — and maybe a little blood, sweat and tears (hopefully ones of joy!). 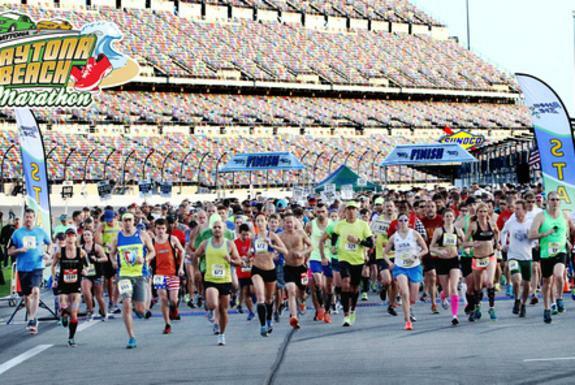 The Daytona Beach Half Marathon is back again for its 10th year this coming February — that’s an entire decade of picturesque running and heart-pumping racing. This event is a favorite among the running community for many reasons. First, there’s the incredibly iconic setting. The race begins 7:30 a.m. on Saturday inside Daytona International Speedway, where many a historic race has been won. Running on this track is a unique opportunity that’s sure to work up some adrenaline and excitement. Just remembering the legends who have raced on this very track will inspire you to give your legs the extra “oomph” they need! This race has been named one of the top seven scenic half marathons in America by Active.com, and there’s a good reason for it. From the famous tri-oval track, racers will proceed to the area’s equally iconic shoreline. Here among the area’s 23 miles of hard-packed, expansive beaches, racing truly earned its stripes. Soak in the salt air and beautiful scenery as you make a short turn on the sand and race toward glory. Along the way, enjoy the pit stops that will be fully outfitted with water, sports drinks and more. And, new for 2019, the 13.1-mile race will curve back around and end at ONE DAYTONA, which is located directly across from the Speedway. Once their race is complete, the runners can celebrate with cold drinks, delicious food and an awards ceremony. The festivities will continue for two full days — so even if you are more of an observer than a runner, there’s still plenty of fun to be had! Not up for the distance of a half marathon, but still want to stretch those legs and get a race in? There will be an “out-and-back” Beachin’ It 5K on Saturday afternoon on the beach. Following that, kick back at the beach party and bonfire! Rest your legs, meet like-minded friends from all over the nation, and raise a glass to fun memories made. To get more info on the race or to register, visit the Daytona Beach Half Marathon website today! Don’t wait — if you register before September 30, you can save big! Registration is open all the way up to race day, but the price will go up as the event draws closer. Not sure where to stay on your visit to the area for the big day? Daytona Beach has a wide variety of accommodation options for vacation and racing crews of all sizes. From oceanfront condos to entire home rentals, find your perfect accommodation fit today!